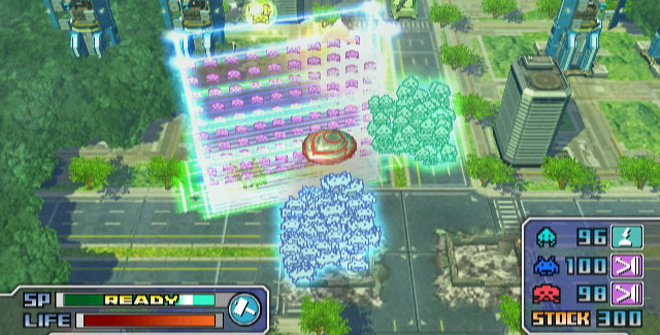 Taito's Space Invaders is making a comeback on WiiWare! In Space Invaders: Get Even you will, in a reversal of roles, play as the space invaders themselves as you take on the Earth! The game was revealed a few months ago as a retail Wii game, but it has now been switched to WiiWare instead (or "download only" as our Japanese source below reports). There are few details for now, but what we know is that you play as the space invaders (Which are 2D and pixelated, of course) as you swarm cities and other places on Earth to destroy them. There are also various kinds of invaders, which all have different functions. The game's tagline seems to be "Get your revenge" which is certainly fitting. No price point or release date has been revealed for now. 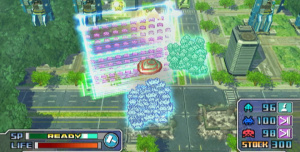 There are a number of screenshots which can be viewed on the game page, however. An interesting take but its still Space Invaders so no. Not for me. Seems like a pretty cool idea. Must be a reason why they aren't releasing it as a fully fledged Wii game anymore....perhaps it wasn't of a high enough quality, or possibly they couldn't flesh it out enough? There are a number of games released on the Wii that would have been better as WiiWare downloads instead. Would still have been crap games though. This seems like a perfect choice for WiiWare. Quick arcade style shoot-em-up action is well suited for the download market. Bring it on! @BDPatVCR - I agree. Actually looks like it could be quite interesting and visually, whilst nothing special, I have nothing to complain about. I would also like to see the original game included as someone else stated on the game page. Awesome! I'm gonna give this a go for sure. It reminds me of SSR. And yes, this IS a perfect choice for WiiWare. I can't wait for it to appear. I remember this game. Didn't consider it back then, but now being available for WiiWare does make it more accessible, might get it. Seems interesting and the graphics aren't bad either. May buy this one if they keep the price low. Interesting. I heard about the game awhile ago but didn't know much. It seems quite decent so i imagine that I'll download it. I am definately downloading this one. I was going to dismiss this one at first, becaused it seemed like another remake, of which Taito had already made, and it seemed better than any remake that would come out on Wiiware(Star Soldier R and Dr. Mario Online RX had evidently taught me nothing about wiiware remakes). But, now that I see that it's completely different, it has my interest. Of course, I'm probably going to have to see how it plays before I get too excited(already too late), as a new direction could wind up bringing down the entire experience, though, I do trust Taito to do a good job once again. Looks... interesting. Graphics are great, seems like they're using the Wiimote well, but really, it all remains to be seen. I have high hopes, though. Personally speaking I don't think I've been quite as excited for a WiiWare title since Alien Crush was confirmed. I can't make sense of what you do or what is happening in those shots. All I see are aliens on human structures. May have potential though. Awesome! The very idea makes me laugh! It's just so fun-sounding. And clever. I love things like this. Heh heh. Yeah, I'm definitely gonna be buying this one. It's slated to release in Japan this summer so hopefully we'll get it in August or maybe even sooner, who knows? Either way, I'm quite excited but it's still not my most anticipated title. Quirky - I'll need a review on how this actually works! But looks intriguing enough to keep me on alert. Could be a lot of fun, and I think it is a much better fit here in WiiWare than as a disc release. Any Multiplayer support?